We’re now entering Silly Season the political campaign season-Arizona has a primary in a couple of weeks. The streets are littered with campaign signs and the infernal phone calls have started. I know one candidate, but it isn’t for political office. 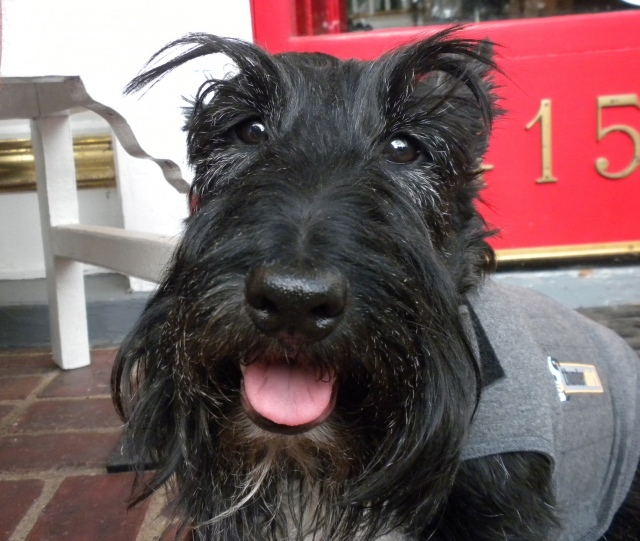 Stuart (scottiechronicles.com) is running for SpokesDog for Thundershirts and you can help elect him. I ask you, have you ever seen a more honest face? 2) Stop the direct deposit of paychecks of those who work for him. This will ensure that all workers will show up at least twice a month. 3) The door to his office will always be open. He may not be there but be next door with his squeeze girl friend Sniglet, but the door will be open. 4) He also promises transparency. He’ll increase the size of the windows into his office. Of course, this transparency and open door policy doesn’t extend to Sniglet’s place. 5) If you vote for him, all recorded calls from him at dinner time will stop. 6) He won’t poop on your lawn and he will remove the “Vote for Stuart” signs on your lawn. You can stuff the ballot box once a day through August 31. It’s easier if you have a facebook account but that’s not required. I’m Kyla Scott, and I approved this message. Kenzie update He’s reasonably active and eating in the morning but not so much in the evening. We’re encouraged seeing that the plateau he’s on is higher than any other one in the last month. I’m barkless. Truly, I am. I just don’t know how to thank you for this my Kyla friend. And Kenzie, too, God love you both. Wait…I forgot about the separation of church and state… “dawG love you both”. That’s better. About this transparency stuff. Does that mean I have to TELL the chipmunks that I’m going to eat them as opposed to, “here chippy, chippy, chippy…Stuart’s not gonna hurt you…. ?” OK. Guess I can manage that. I’m really in the running now…..SHOE OF SHAME’S OFF AND SHE’S READY FOR BUSINESS! Anything said to a chippie is a “campaign promise”. ROFL!!!! We’re on a roll now…. Glad both of you Kyla and Kenzie are on an upward swing. Strike up the band-I know how you love music. So happy to learm Kenzie has been eating a bit better. Also happy to see that Miss Kyla is rid of the bootie. I snt Stuart’s stuff out on my Facebook page hoping a bunch of those ” Friends”vote for him. I didn’t know Angus had a sister. Kenzie’s interested! I am his Human Sister..
Kenzie says “Oh, I see now” but wishes you the best! I voted for Stuart!! I’m glad you are both doing better. Your shoe looked kinda cute, but I understand…. I had to hide my paw in shame! I’ve been voting for Stuart everyday! I hope he win’s he’d be the bestest spokes dog evar! The election should be Russian-style. It’s over and Stuart won because I said so. Wez went over to vote but wez got to open a facebook account 🙂 Gonna do that later 🙂 So pleased Kenzie is on the up… Hay where’s ya booties?? BOL. You can vote without a facebook account. I refuse to get one. It just makes it easier. Use the “register” link. Y’all ARE THE BEST!!!!! Thank you!!!! Thanks. I’d ask for a free T-shirt out of this but I don’t need one. I’m used to thunder and lightening. That doesn’t mean I don’t have fears. Kenzie is scared of the groomer and I’m deathly afraid that I’ll starve to death sometime. You are right – there no face more honest than that. Definitely got my vote!